The Skyrocket and F-86 Chase plane are two early examples of swept wing airfoils. 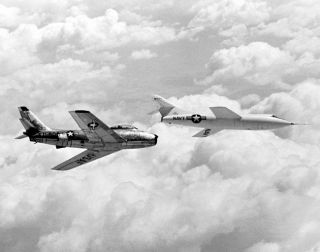 In this historic photo from the U.S. space agency, this mid-1950s photograph shows the Douglas D-558-2 and the North American F-86 Sabre chase aircraft in flight. Both aircraft display early examples of swept wing airfoils.